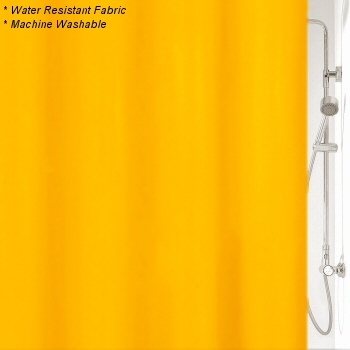 Our shower curtains are designed and produced by well-known German brand Kleine Wolke, established in 1968, and is backed by their quality guarantee. No liner necessary. Quick-dry, long wearing, easy-care polyester fabric with weighted bottom hem. Our Kito fabric curtain design is available in six solid colors and three sizes, shower stall - 8 eyelets, tub - 12 eyelets or extra wide - 16 eyelets. Sunshine: Yellow orange color tone is bold and bright. Truly like sunshine. A perfect way to brighten up your bathroom. Red: Bright red fabric shower curtain. Crocus Blue: Solid deep blue shower curtain available in three sizes - tub, shower stall and extra wide to wrap around the end of the tub. Spring Green: Bright grassy green. Just beautiful and perfect for spring or summer. Slate Grey: Solid slate grey shower curtain. Snow White: Bright white fabric shower curtain available in three sizes - tub, shower stall and extra wide. This non toxic fabric shower curtain is available in standard tub width with 12 eyelets, shower stall width with 8 eyelets and extra wide with 16 eyelets. SIZE ALERT: Our 16 eyelet extra wide Kito is 70.9 inches in height.